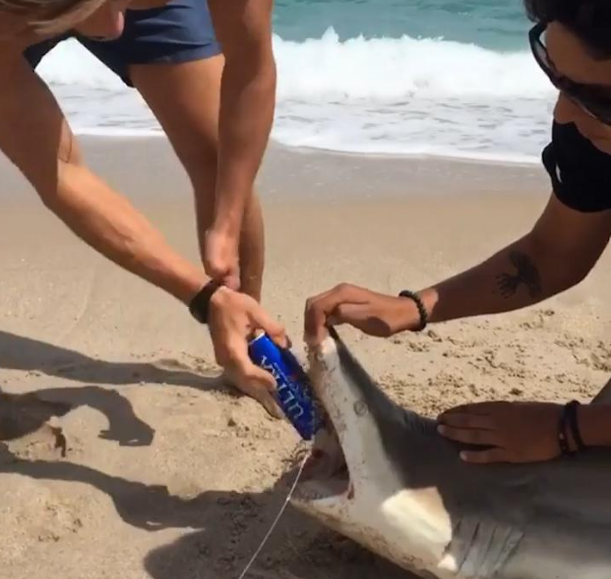 A Florida student has apologized for using a live shark to open a beer while on Spring Break. 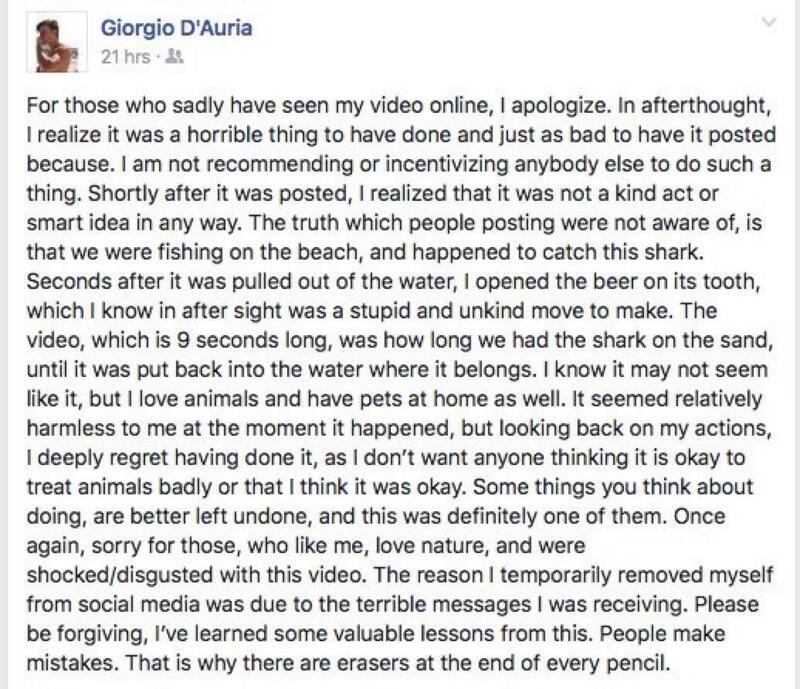 Last weekend, in an attempt to claim a $500 prize from bro-media site TFM, Giorgio D’auria used a shark’s tooth to break open a beer and chug it. The fish, which was alive at the time of filming, was held by the neck with its mouth propped open as Giorgio hit the can against its teeth. 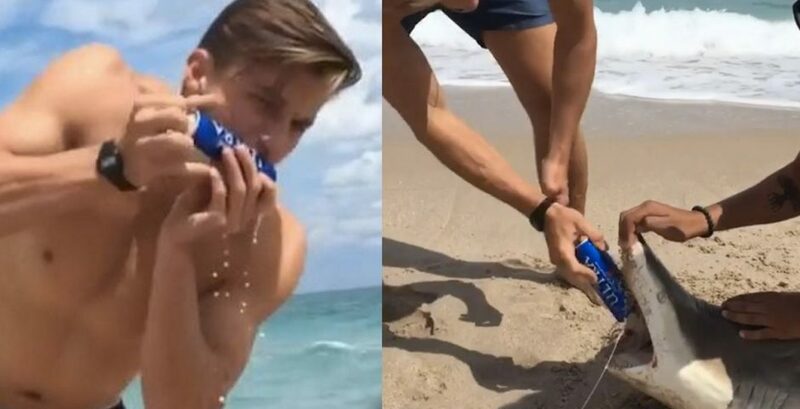 Within hours of posting the video went viral, with news site after news site referring to him as an “idiot frat boy”, commenters calling for him to be exposed to a shark attack “that rips off all his limbs” and for him to be expelled from his university. The student, originally from Brazil, is not a member of a fraternity as they are prohibited at Flagler College where he is currently a junior. His profile as a student tennis coach on the Flagler website was removed earlier today, but the school has yet to comment on whether he was removed from his position. Yesterday, he surfaced on social media to post an apology in which he said “I love animals” and that he was “disgusted” by the video. “For those who sadly have seen my video online, I apologize. In afterthought I realize it was a horrible thing to have done and just as bad to post it. I am not recommending or incentivizing anybody else to do such a thing. Shortly after it was posted, I realized it was not a kind act or smart idea in any way. The truth which people posting were not aware of, is that we were fishing on the beach and happened to catch this shark. “Seconds after it was pulled out of the water, I opened the beer on its tooth, which I know in after sight was a stupid and unkind move to make. The video, which is nine seconds long, was how long we had the shark on the sand, until it was put back into the water where it belongs. I know it may not seem like it, but I love animals and have pets at home. It seemed relatively harmless to me at the moment it happened, but looking back on my actions, I deeply regret having done it, and I don’t want anyone thinking it is okay. “Some things you think about doing are better left undone, and this was definitely one of them. Once again, sorry to those, who like me, love nature and were shocked/disgusted by this video. But his friends have stuck by him, with one of them telling The Tab he didn’t really understand the fuss. Flagler College has been reached for comment.